(Lanka e News - 28.Oct.2018, 11.30PM) We are a group of Sri Lankan students currently pursuing our education overseas. We write today to express our deep concern about Sri Lanka’s ongoing constitutional and political crisis. Since 1931 Sri Lanka has had an imperfect and fragile, yet electorally and legally mandated, democracy. On Friday the 26th of October, for the first time since Sri Lanka’s independence, an unconstitutional and illegal transfer of power occurred. President Maithripala Sirisena, violating his oath of office and the mandate given to him on January 8th 2015, attempted to appoint Mahinda Rajapaksa, Member of Parliament for the Kurunegala District, as Prime Minister. This was unconstitutional. The 19th Amendment deleted the President’s power to remove the Prime Minister at will. While the President still appoints the Prime Minister, he has no implied power of removal since this is now governed by explicit provisions in the Constitution. Moreover, the withdrawal of the UPFA from the national government makes no difference: the Constitution does not provide that Cabinet ceases to function, and therefore that the Prime Minister loses his position, when one party in a national government withdraws its support. In any event, there is a democratic means of settling this question - a test of confidence on the floor of Parliament. Yet President Sirisena and Mr. Rajapaksa did not propose a motion of no-confidence or engineer a defeat of the Budget to remove Prime Minister Wickremesinghe. Indeed even after Mr. Rajapaksa’s illegal appointment, President Sirisena decided to prorogue Parliament, demonstrating what was clear from the beginning: Mr. Rajapaksa does not have the confidence of a majority of the representatives of the people. 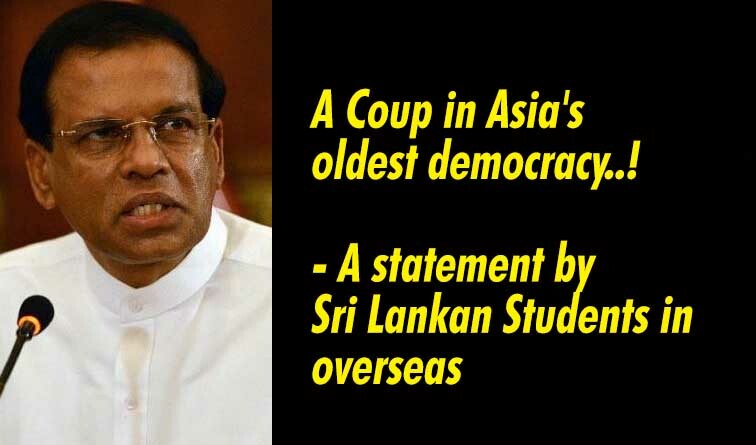 His covert appointment, the illegal attempt to remove Prime Minister Wickremesinghe, the suspension of Parliament without consulting the Speaker, and the mob-led take-over of State media institutions make it clear that this is a coup d’etat. The resort to violence and coercion is a chilling reminder of what dictatorship looks like. The coup is being followed by a return to the norms of self-censorship, violence and fear that were characteristic of Rajapaksa-era politics. State media institutions were stormed in the night and security for the Prime Minister and Ministers arbitrarily withdrawn. Moreover, many private media stations are already becoming vehicles for misinforming the public and spreading disinformation. By referring to Mr. Rajapaksa as Prime Minister they are renouncing the constitution and the democratic process, and normalizing an illegitimate regime. 1. President Maithripala Sirisena to rescind his order proroguing Parliament. 2. The Speaker of Parliament, Karu Jayasuriya, to immediately summon Parliament. 3. A vote to ascertain whether the government of Prime Minister Ranil Wickremesinghe commands the confidence of Parliament. 4. All those responsible for this coup to be held accountable for their actions. 5. All public servants to uphold the Constitution and fulfill their obligations set out in law. The unprecedented events of last week have reinforced the fragile nature of our democracy. They are also part of a broader problem in our political culture. Once more, power is being used purely for political gain rather than towards building people-centered institutions and an inclusive and democratic political culture. These acts damage the health of institutions and processes that sustain democracy, pluralism and rights. They will have a permanent impact on the future of Sri Lanka’s youth. As students of different ethnicities and religions, institutional affiliations and professional backgrounds we, the undersigned, condemn these recent developments, encourage others to make their voices heard, and commit ourselves to using our education to build a more just, fair and democratic Sri Lanka.